SOUTH BEND, Ind. (AP) — Jerry Tillery was basking on a beach in Hawaii with friends when suddenly he was panicked, wondering if a nuclear war had begun. “The craziest thing ever,” Tillery said. “People were running, screaming from the beach.” The warning of imminent disaster passed 38 minutes later when a second message was sent describing the first as a false alarm. 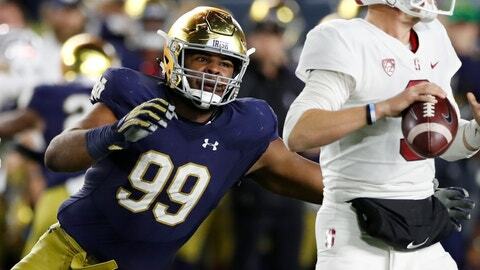 Two days later, Tillery was back at Notre Dame for the first football team meeting of the new year, where he told teammates and coaches that he would return to school for his senior season. “Great memories, I guess,” Tillery now jokes about a vacation and a decision that he will never forget. Tillery might have been a high NFL draft pick had he left school after his junior season, but instead he is cementing his status as one of the best defensive linemen in the country. He is the lynchpin of a No. 6 Notre Dame’s stingy defense and leading the nation in sacks with seven after getting four last week against Stanford. The Fighting Irish (5-0) play at No. 24 Virginia Tech (3-1) on Saturday night. Tillery has always had a curiosity with travel and interests that go way beyond football. He has logged study abroad programs in Cape Town, South Africa, Dublin, Ireland, and Tokyo, Japan. Germany was a spring break destination. He went to Canada over Easter break. He’s been to Venice, Italy; Auschwitz, Poland; he’s planning to visit South Korea; and the trip to Hawaii in January was his fourth to the islands. Tillery is also a stock market junkie. His eclectic Instagram interests include Peruvian fashion photographer Mario Testino, “The New Yorker” magazine and the Guggenheim Museum. For being such a smart guy, he’s done plenty of not-so-smart stuff. After appearing in all 12 regular-season games as a freshman in 2015, Tillery was suspended for the Fiesta Bowl after an unspecified team rules violation. Tillery became a steady starter as a sophomore in 2016, but is perhaps best remembered that season for a Twitter tirade in which he indirectly lobbied for fired LSU coach Les Miles to replace Kelly. There were also two temper tantrums during a 45-27 loss at USC in the regular-season finale — the first when he kicked a Trojan player in the head and the second when he stomped on another’s leg. Fast forward two years and Tillery is a better player and a changed person. With an economics degree in hand, Tillery this semester carries the lightest class load of his academic career, so he’s able to better concentrate on football and his favorite class, saxophone. Tillery’s decision to return for his senior year was in no small part fueled by an offseason proposal that would slide him from nose guard down a couple gaps along the defense line to the three-technique, a position switch designed to shed the 6-foot-7, 305-pounder from the endless double-teams he faced last season to better showcase his athletic abilities and boost his NFL stock. He is on pace to better the single-season Irish record of 13½ set by Justin Tuck in 2003. Meanwhile, Tillery is just trying to stay in the moment and savor his last go-around at a place that has taught him much about football, travel, music, maturation and then some.